The icons of the University of Notre Dame: the golden dome, the grotto, the stadium, and the gold helmets, are as important to me as beach icons I paint. I’m a triple legacy: my grandfather, Frank O’Toole, class of 1928, played football for Knute Rockne. My father, class of 1955, fought in the Bengal Bouts. My husband and I, class of 1985, met in an art class at Notre Dame, and were married in the log chapel. I may be prejudiced, but I think it’s the most beautiful college campus in the world. One of my favorite things to do is to fly in for a game- nothing like an crisp October game day to wake up the echoes and shake down the thunder!- and set up my easel in the god quad, paint the dome and swap stories with other fans. Go Irish! Stretched Canvas, signed, numbered, ready to hang. Exhibiting at Morris Inn, Notre Dame IN. Limited to 100, each hand signed , numbered and remarked. Its been six years since we’ve had all the Rivalry Trophies! How sweet to see Brian Kelly drinking red gatorade blood of trees after the Stanford game! 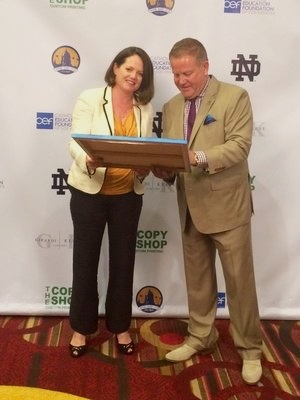 Kathleen Keifer with Notre Dame Heisman Trophy winner Johnny Lujack.